• Suitable for freight cars, and 4-axle locomotives. • DO NOT USE THIS DERAIL if 6-axle locomotives operate on your tracks. Use our 2-way locomotive derail (4014-18) or our retractable derail (4114-11) instead. • When you positively have to stop a freight car or locomotive — Derails are emergency stopping devices designed to guide the wheels of a freight car or locomotive off the rails. OSHA requires that every industrial siding be equipped with a derail to deny locomotive entry before railcars are ready to be removed. • Hinged derails are lifted on and off the rail by hand or with Lifting Lever (#4014-28 and #4014-25). The blue derail sign is separately lifted and lowered by hand. For more convenience consider the Pop-up Sign Holder for either 1-way or 2-way derails. • One-Way Hinged for Wooden Ties FOR FREIGHT CARS & LOCOMOTIVES Aldon derails are designed for cars and locomotives operating at SLOW SWITCHING SPEEDS (5 mph or less). • CAUTION: Install derails on exposed rail track only. For rails 80-141 lbs. Derails are sized to fit a specific rail height, including thickness of tie plate. 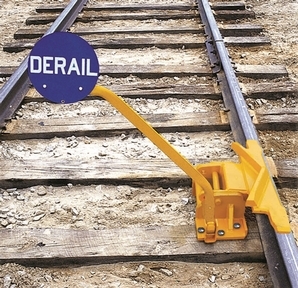 Blue derail sign and holder are included with the derail (see MoonSign). Six screw spikes are provided for proper anchoring to ties. Height of derail above rail, 2"
• NOTE: Hinged derail is designed for use on tracks with wooden ties. Use screw spikes (supplied with Aldon Hinged Derails) for proper anchoring of derails to wooden ties. If you have steel ties see #4014-13, Base Plate Accessory. Do not install derails on resin or concrete ties.